Here is more detail about the conference programme and biographies of presenters and facilitators. Presentations will be uploaded here after the conference. A powhiri is a traditional Maori welcome that sets the scene of our conference. This is most appropriate as this conference brings together people from all over Te Tai Tokerau to create partnerships for climate resilience. Here is a guideline for NorthTec’s powhiri-protocol. The venue, NorthTec’s Te Puna o te Matauranga marae is an outstanding example of a whare hui adorned with contemporary Maori design. New Zealand can lead the world in transitioning to a high-value, clean-tech, post-carbon economy that works for everyone. It’s one of the many reasons James joined the Green Party in 1990, and why he’s extremely excited about being a Minister in the Labour-led Government. This Government will bring the large-scale, transformational change that is needed to build a truly sustainable economy, a diverse inclusive society, and to restore and replenish our natural world. Prior to becoming an MP, James had a successful career in management consulting, primarily in London, where he lived from 1998 to 2010. James worked with large, multinational companies across Europe and around the world, helping them develop more sustainable business practices. While studying in the UK for a Master’s degree in sustainable development and business leadership, James realised that the private sector alone wasn’t able to affect change at the speed and scale necessary to meet the great challenges of our time. James’ diverse business experience and expertise, from working for multinational corporates through to local start-ups, social enterprises and community organisations, will enable him to lead the Green Party, the Government and New Zealanders towards a high-tech post-carbon economy and society. The conference was inspired by the Drawdown Project led by Paul Hawken. Unlike some of the prophets of doom, Paul Hawken’s team provides a wide range of solutions for climate change. Peter outlines the project and those solutions most appropriate for Te Tai Tokerau. He also explores some of the requisites essential for successful change and expands on the aim that this conference will initiate research and implementation projects to implement Drawdown solutions here. Peter is a Senior Lecturer on the Business Management Programme at Northtec, a foundation member of Local Food Northland and one of the four convenors for this conference. He was born and bred in Northland and has lived here most of his life. From his schools days at Te Kopuru school he developed an interest in sustainability, a passion that remains with him five decades later. His first career was in horticulture, initially working on an orchard and bamboo nursery in the Far North before moving back to the Northern Wairoa for more nursery work and in amenity horticulture. After teaching horticulture at NorthTec he then taught management for many years. His research focus is on sustainable food systems. 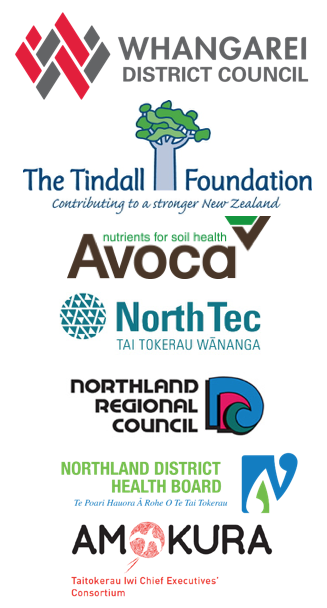 Here is a link to Peter’s Local Food Northland conference presentation. Climate change is a medical emergency; it has been described as the greatest global health threat of the 21st century. Māori and other Indigenous peoples face disproportionate adverse impacts on health and wellbeing. Both climate change itself and the actions countries take in response threaten to exacerbate existing inequities between Indigenous and non-Indigenous populations. But on the other hand, tackling climate change could be the greatest health opportunity of our generation. Many of the actions our society needs to take to address the climate crisis can bring about significant benefits for population health. If these actions are carefully planned, prioritising Māori rights including the right to health, they can also contribute to eliminating health inequities. Rhys will discuss how Māori health and wellbeing is threatened by climate change, which can be seen as an intensification of the process of colonisation. He will then outline how a decolonising approach to climate action can not only improve environmental outcomes but also advance Māori health and equity. Dr Rhys Jones (Ngāti Kahungunu) is a Public Health Medicine Specialist and father of three boys who lives in Auckland. He is currently a Senior Lecturer at Te Kupenga Hauora Māori, University of Auckland. His research interests include ethnic health inequities, the role of health professional education in advancing indigenous health, and environmental influences on Māori health. Rhys is also Co-convenor of Ora Taiao: The New Zealand Climate and Health Council, a health professional organisation calling for urgent, fair and healthy climate action. Rangimarie is CEO for Amokura Iwi Consortium Ltd, a charitable company owned by seven Iwi entities in Te Taitokerau namely, Te Runanga o Ngati Whatua, Ngatiwai Trust Board, Te Runanga Iwi o Ngapuhi, Te Runanga o Whaingaroa, Te Runanga o Te Rarawa, Te Runanga o Ngai Takoto Custodian Trustee and Te Kahui Kaitiaki Rangatiratanga o Te Aupouri Ltd. Amokura was formerly the Te Taitokerau Iwi CEOs Consortium, who wrote the first tikanga based economic growth strategy for Te Taitokerau, He Tangata, He Whenua, He Oranga which was launched in February 2015. Climate change poses significant risks and at the same time opportunities for Maori, to normalise their own tikanga and values around manaakitanga and kaitiakitanga into mainstream thinking as a means of pursuing a more durable and socially equitable pathway for social, economic, cultural and environmental wellbeing. Nationally and regionally climate change action is a priority for Iwi. Rebecca Mills works internationally in transformation strategy and innovation, through the lens of sustainability. From launching and leading her mission driven company in 2008, she has since worked with progressive companies and entrepreneurs, government entities, non-profits and philanthropists – helping them create maximum positive impact at pace and scale. She has a proven track record of incubating new ventures, and transforming existing ones to create the best win-win opportunities for people, profit and the biosphere. Rebecca has worked with high performance teams around the world. In 2011 she joined Founders Sir Richard Branson and Jochen Zeitz to help build what is now known as The B Team- a not-for-profit initiative formed by a global group of business leaders to catalyse a better way of doing business. She led the development critieria for the world’s first ‘eco-region’ for the United Kingdom, and the team who built the impact strategy for the largest regeneration site in Europe. In New Zealand, she has catalysed many cross-sector initiatives and also led both New Zealand’s first Regional Energy Strategy and the implementation plan for a Low Carbon Auckland. A business mentor for companies across Europe, the U.S and New Zealand, Rebecca is also an Independent Director sitting on two of MBIE’s Science Challenge Boards. A former biosphere scientist she has also trained with Clayton Christiansen in his approach to Disruptive Innovation through Harvard Business School.